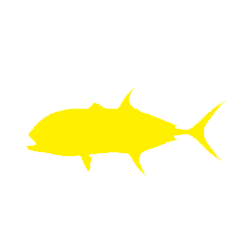 These guys are all over the place and a lot of fun! The Jacks are back and will be a great target this week. 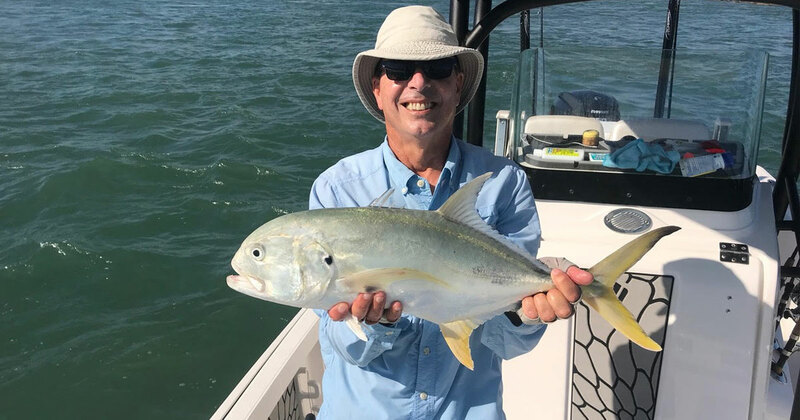 The 6-12 pound Jack Crevalle are back in numbers and if you are fishing the beaches and Sebastian Inlet by boat or jetty, you should be able to get into some good action between other target species. Live pinfish and greenies have been the best baits to get them fired up. Along with the jacks, the Bluefish and Redfish are in the inlet. But you will have to get through the jacks to get the others to bite. Snook bite is still a little slow but look forward to them to turn on anytime in the next week or two. Catherine with a fat trout. 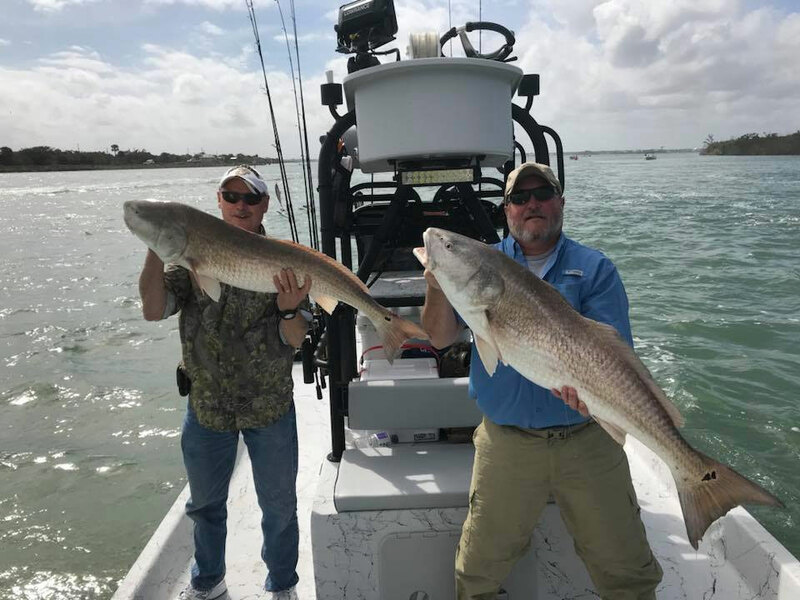 Inshore bite around the docks, spoil islands and mangrove shorelines is good and will get better as we continue to get more bait in the lagoon. Live finger mullet, pigfish, small pogies and greenies and shrimp below popping corks are working great for live bait. Artificial bite was a little slow this last week with the dirty water but should pick back up when the water cleans up. 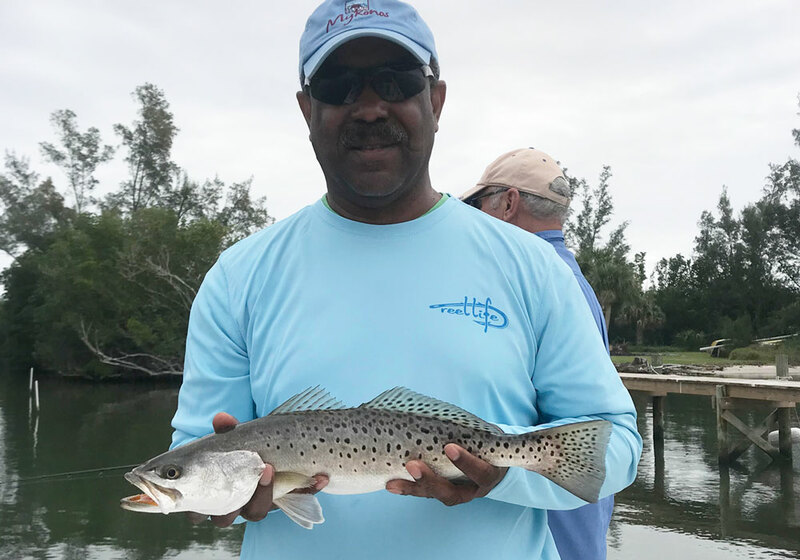 Trout, snook, jacks, pompano, spanish mackerel and some redfish are going to be great targets but the big trout are some of my favorite to catch this time of year. I like to practice catch and release on the big trout to help out the population. Russell brought this nice snook home for dinner! The Sebastian River, Turkey Creek and Crane Creek are all very active and a great place to hide from these winds. 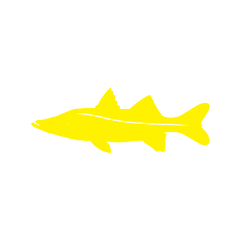 Fish live shrimp or mullet along the docks and shorelines for Snook and jacks and look in the deeper water for rolling tarpon. Had a great weekend and looking forward to a good week this coming week. 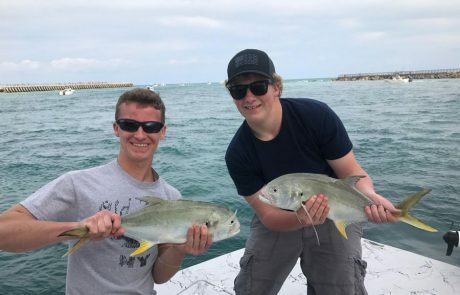 Last week Jesse had a great bite in the lagoon using popping corks with live shrimp and Storm 360 Coastal Shrimp around the spoil islands and deeper docks from Grant to Sebastian produced a lot of Trout, Pompano, Jack Crevalle, Bluefish and Ladyfish. 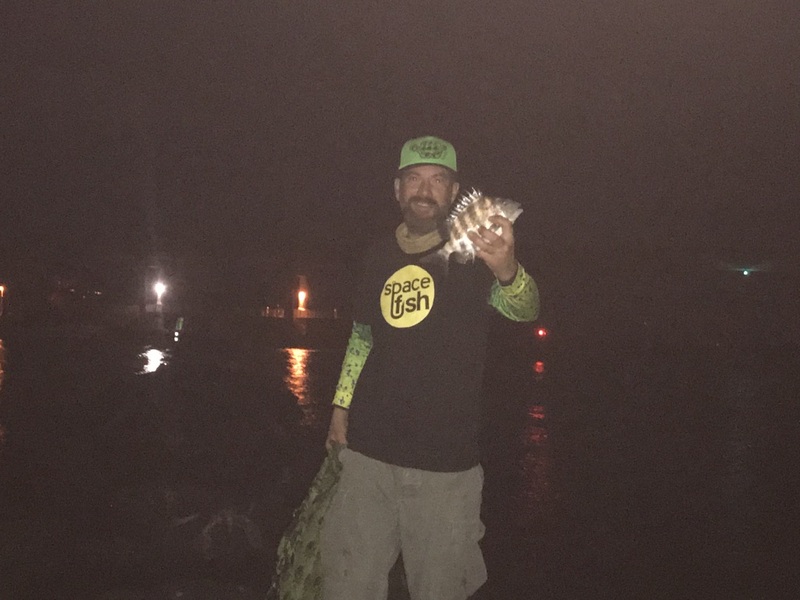 Same results with paddle tail baits and 4” jerk baits fishing around the islands, docks and deeper mangrove shorelines. Over the weekend we were able to get off the beach and had good action from Sharks as well as Jacks and a few cobia following the Manta Rays. 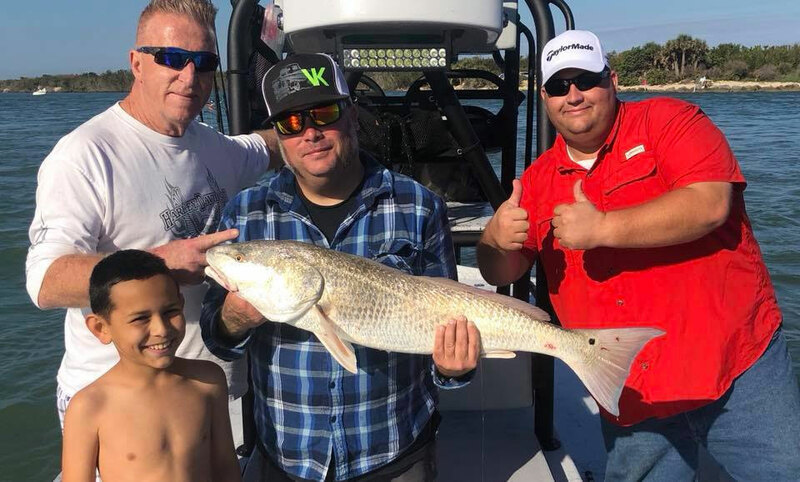 Inlet has had some snook and reds for anglers using live Mojarra. 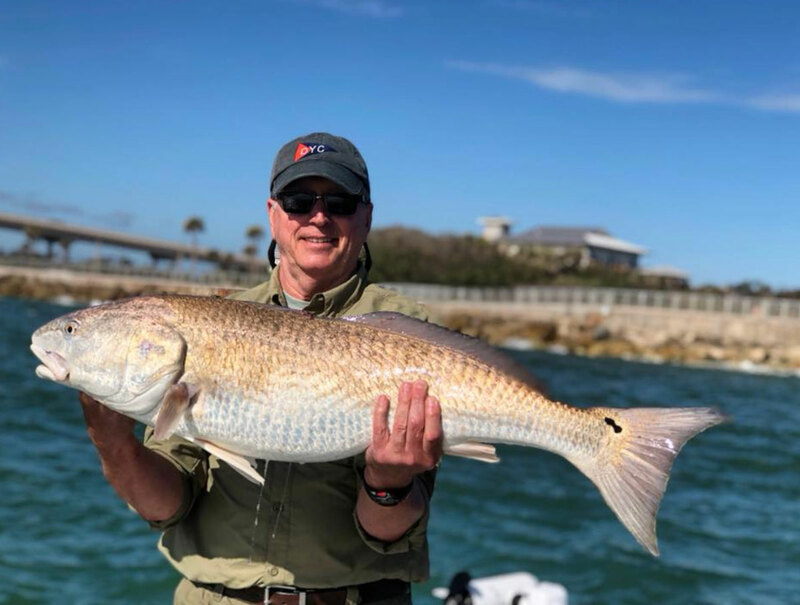 Next week, look for the action along the beach to be good as well as in the lagoon as the bait is coming back well with the warmer temps and the southern winds. 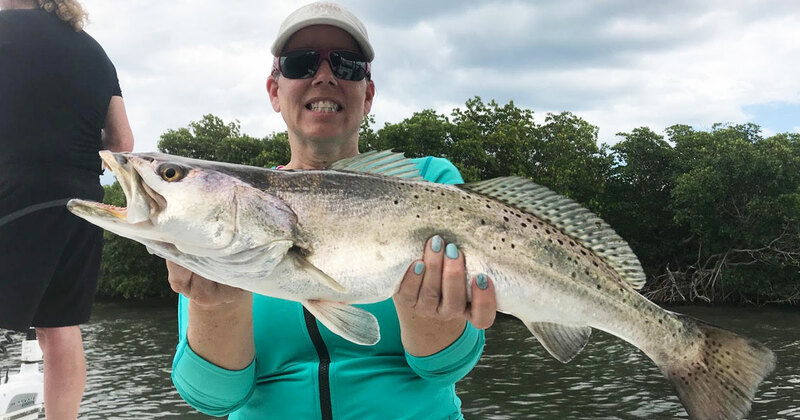 The lagoon will produce more trout pompano jacks and bluefish along with the few snook and reds along the mangrove shorelines. 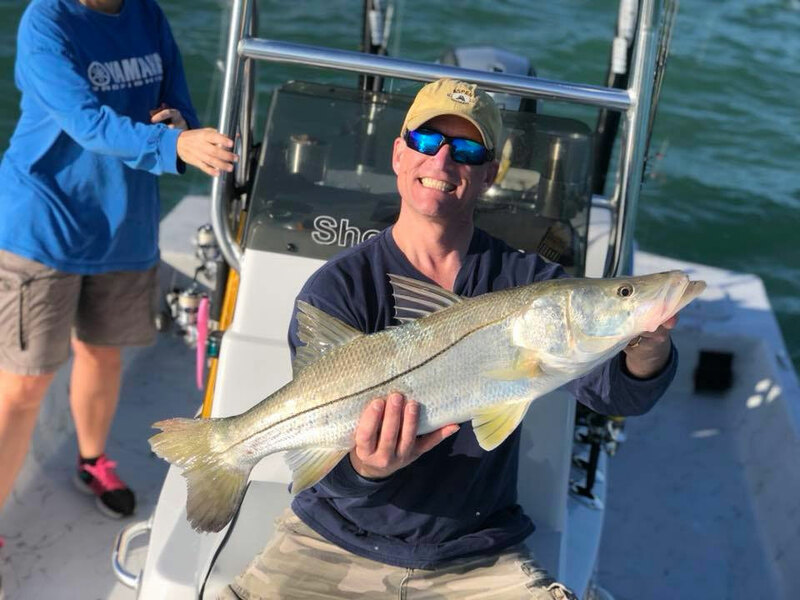 The inlet has been producing some snook and reds and if the weather pattern stays consistent, look for good action on live bait during the daytime and bucktail jigs as well as Rapala Rap 14 lures at night. 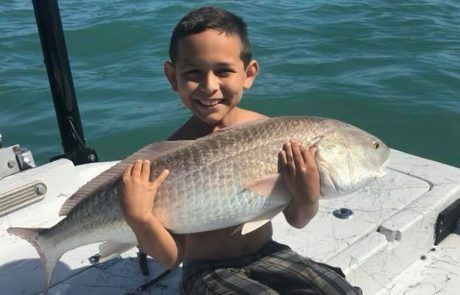 Neashore anglers can expect sharks, jack crevalle spanish mackerel and bluefish along the beaches from Melbourne beach to Vero Beach. 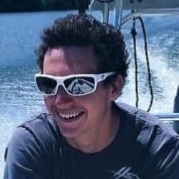 Spent most of the week inshore due to the high winds. It was mostly trout catches for us inshore, but the pompano bite fired up really good towards the end of last week. 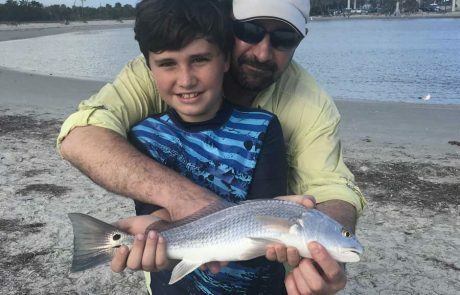 It seemed like sand fleas were the most productive baits both inshore and on the beaches. 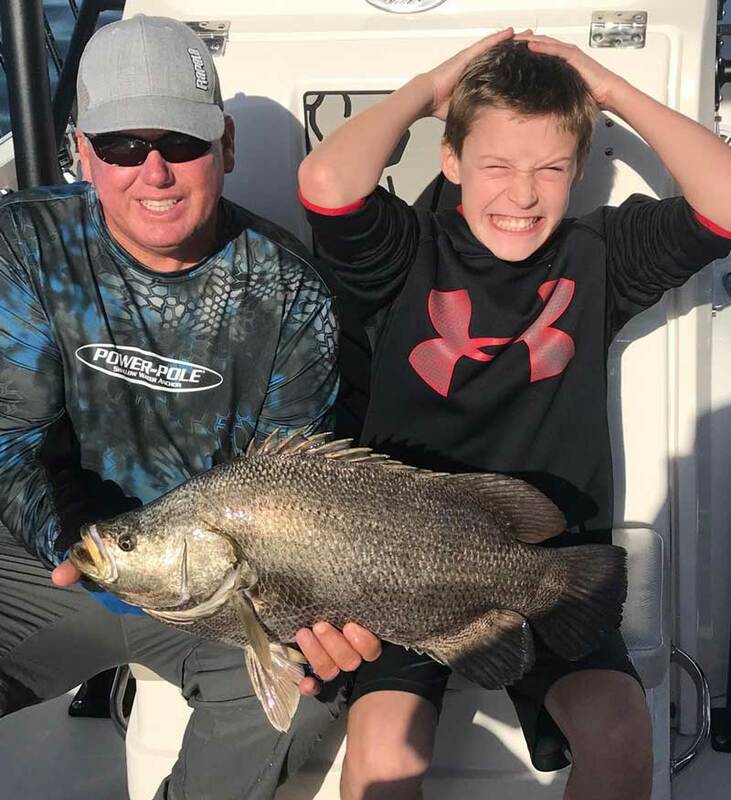 We’re also still getting decent numbers of tripletail along the crab trap buoys down by Sebastian inlet on live shrimp. 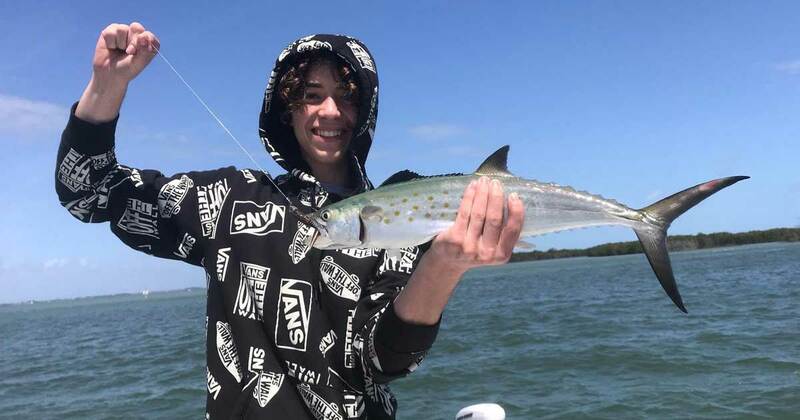 The bite at Sebastian Inlet was decent with plenty of pompano on jigs, as well as bluefish, mackerel, jacks and some ladyfish. The snook have started to turn back on and live greenies have been the best baits for eliciting their attention lately. Pilchards and Mojarra are also both great baits this time of year. If the winds stay down this week, keep an eye out for snook and reds in the inlet, and along the beaches, look for pompano, sharks, jacks and mackerel. 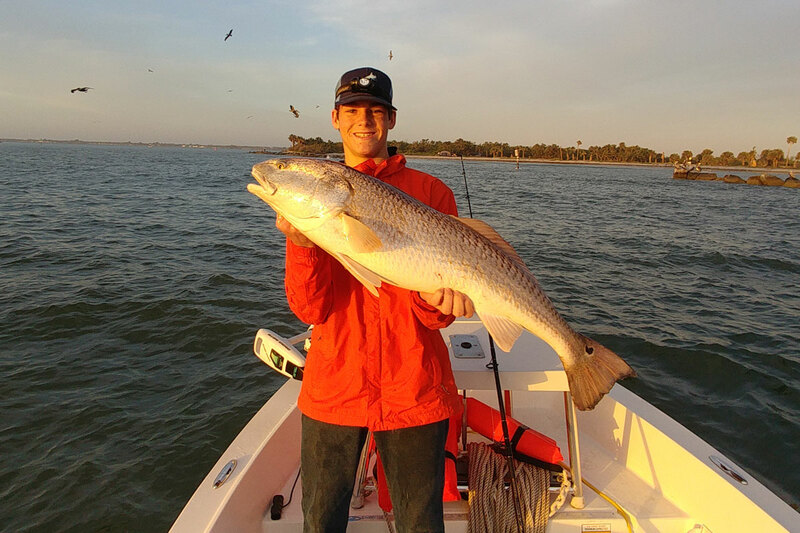 If the winds are up, fish the lagoon for trout, snook, and reds, along with the pompano, bluefish, and jacks on artificial. Had a really good week inshore and nearshore. Plenty of trout, jacks and a few snook in the lagoon this week. 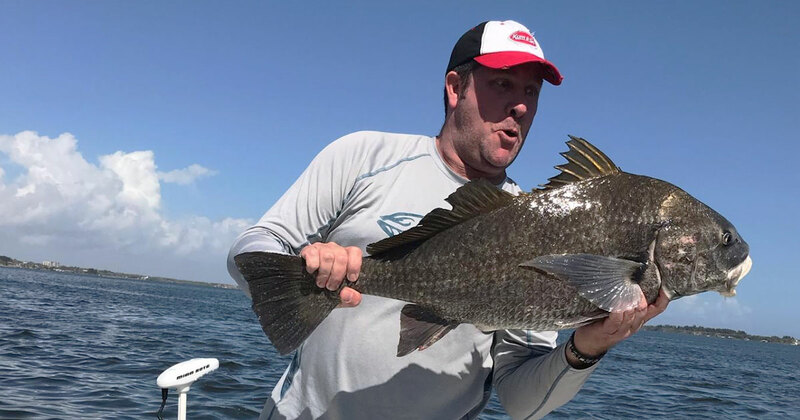 Most of the fish were caught on Storm 360 Coastal Series jerk baits and paddle tail baits around the spoil islands. 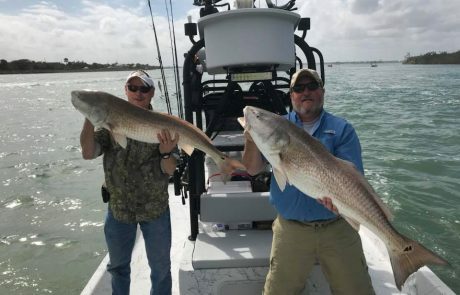 We also had a pretty good triple tail bite inshore on live shrimp. Nearshore still has a bunch of jacks, mackerel and bluefish with some pompano and sharks mixed in. Goofy jigs are the best artificial for Pompano and the blues and Mackerel are eating anything with a flash. 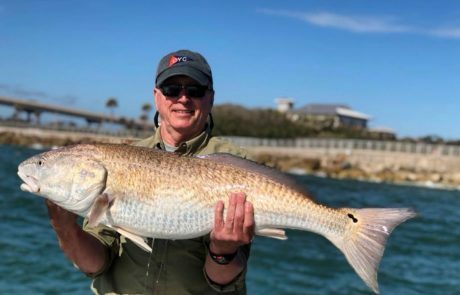 The sharks are eating anything you throw at them as far as live bait with a great bite on topwater, too. We had some rays nearshore with cobia on them eating jigs and live mullet or greenies. 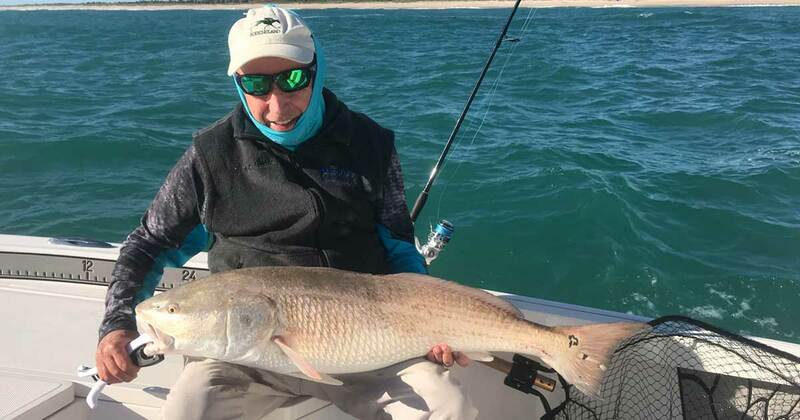 Winds are gonna be up pretty high early this week so the best opportunity to get on the water will be inshore, so focus on deeper areas around islands, docks and deeper shorelines for trout, snook and reds. Had a good week last week up until the front came through. The beach fishing was on fire with a bunch of pompano, bluefish, mackerel and blacktip Sharks. We did some shark fishing on poppers and it was a great time. 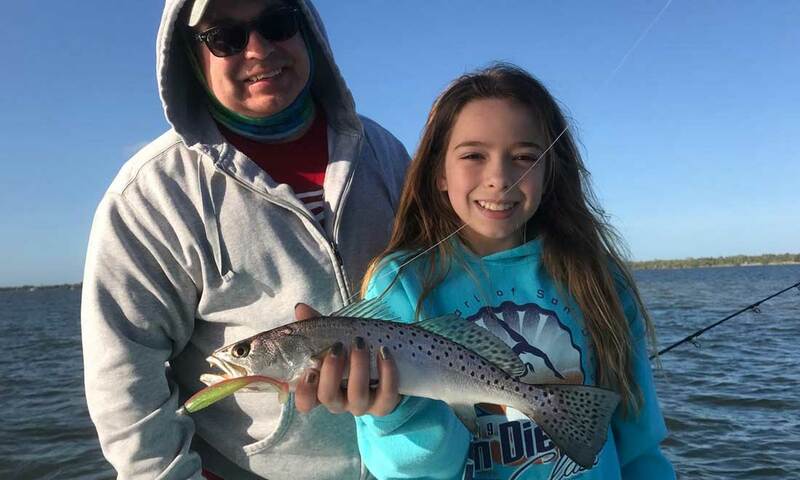 Inshore fishing was pretty good around the spoil islands and deeper docks for seatrout, pompano, bluefish and jacks. Soft plastics worked well as did subsurface baits. 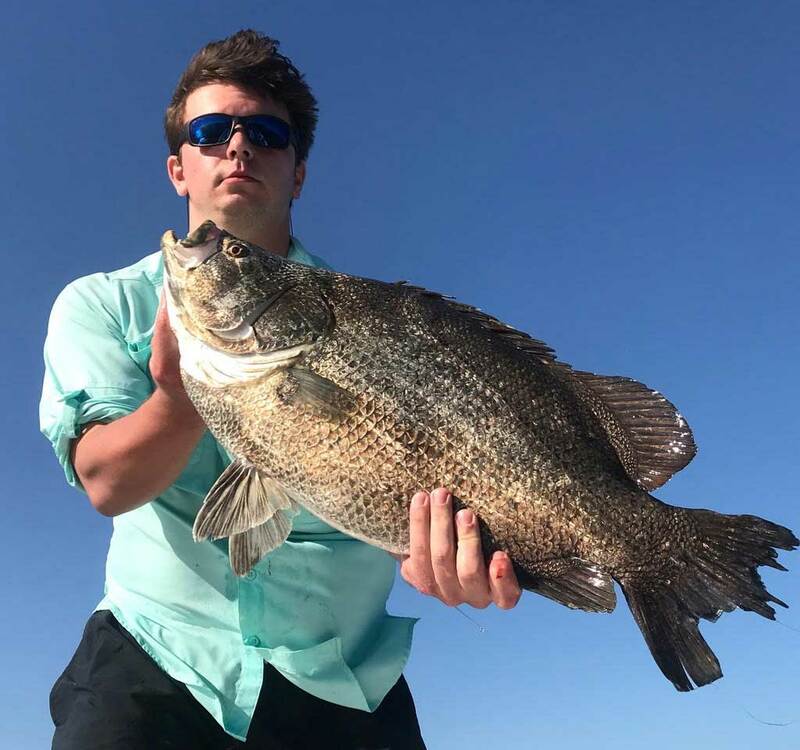 The triple tail were along the markers but I expect that bite to slow as there are a lot of people targeting them. 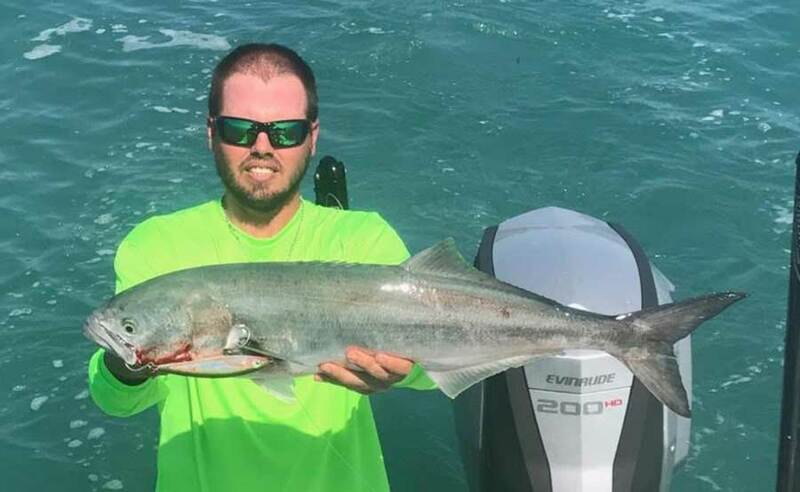 The beach is warming up a bit and once the temps consistently hit that 70 degree mark we should have steady Cobia action along the beaches. Been a super busy week for Jesse and I. Jesse got some offshore time in early in the week and got into some cobia as well as snapper and some triggerfish. 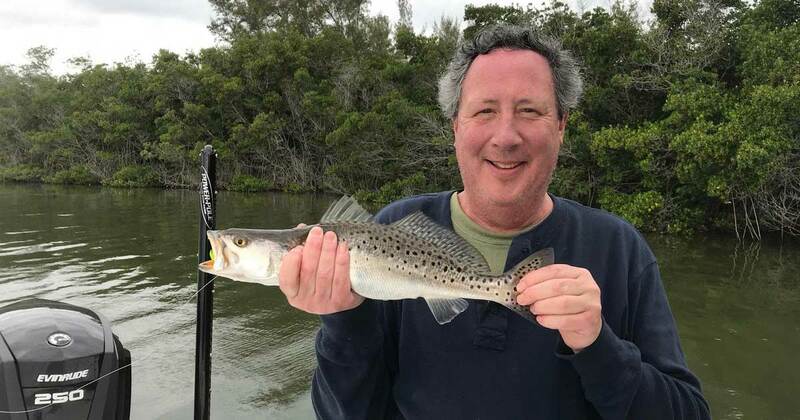 The inshore bite for trout has been pretty good around the spoil islands and deeper docks from Palm Bay down through Sebastian. Along with trout, we’ve had some good action with pompano, blues and jacks inshore. 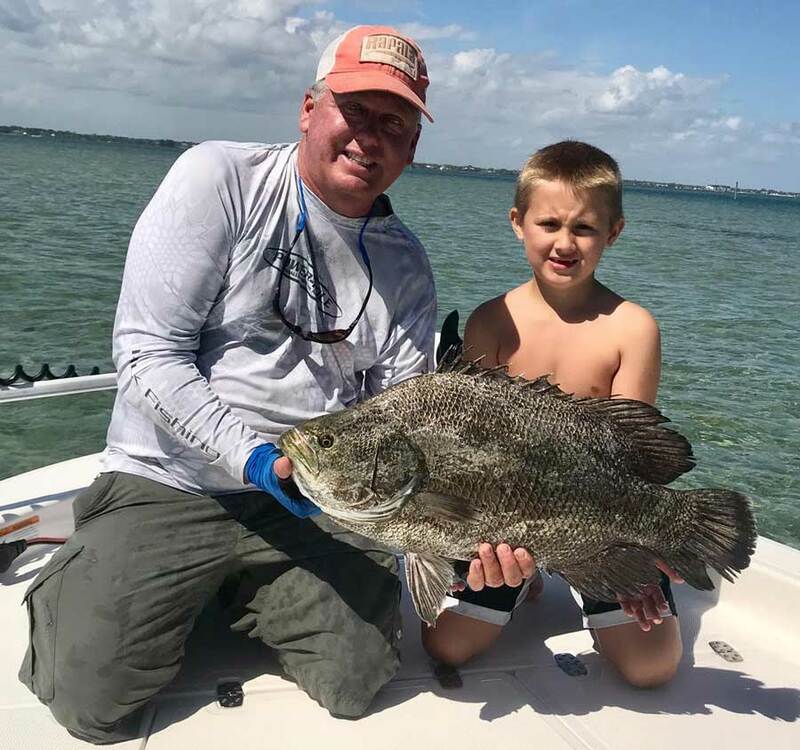 Tripletail are still along the weed patches nearshore with some in the lagoon on the crab traps. LC with one of a bunch of trout he got this week. 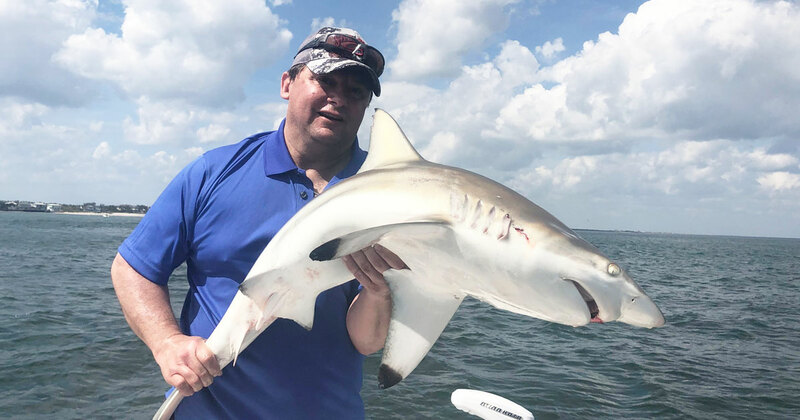 The nearshore bite is still good for pompano, blues Mackerel and Jacks along with Blacktip Sharks and Bull sharks. Anything with flash will work for the macs and blues and the sharks are eating just about anything we have been catching. This front coming through will change up the bite and hopefully the cold won’t last too long and shut down the bite. 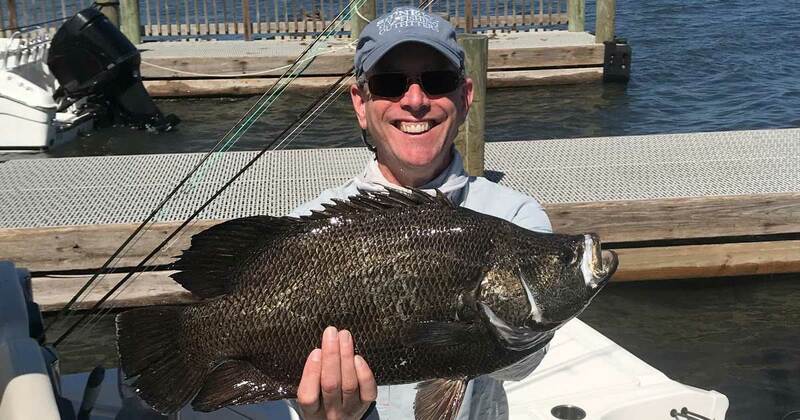 Jim took this tripletail home for dinner. 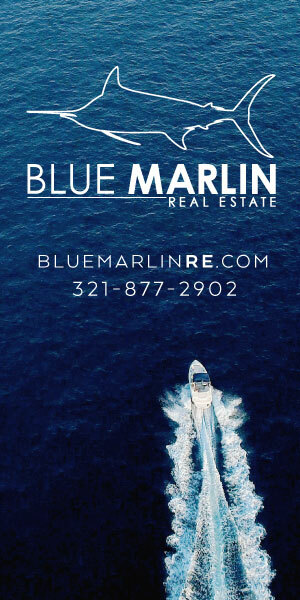 This week we have been doing a lot of charters in the Sebastian area. 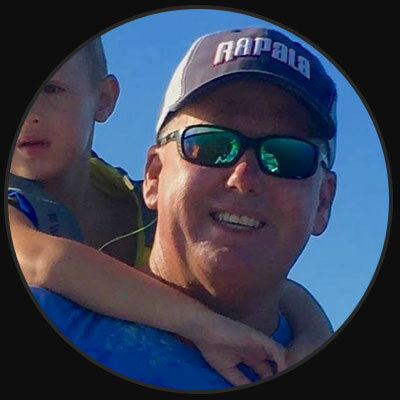 The bluefish and Spanish mackerel bite has been really strong when you can avoid the wind and waves. 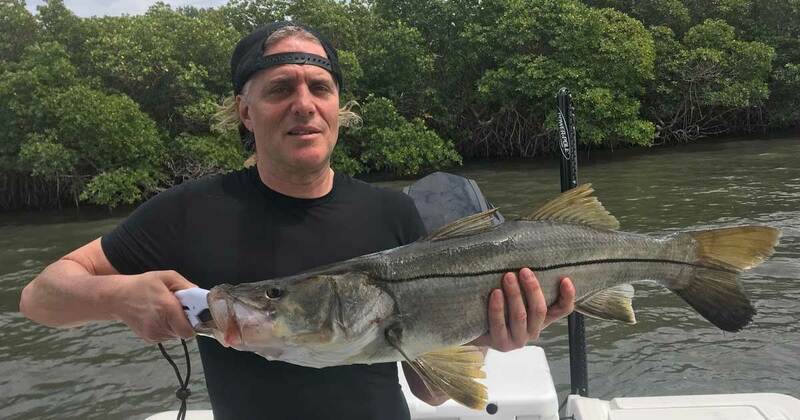 We are expecting snook and tarpon to show up on our coast as the weather warms up, and will be looking for schools of these fish throughout the next couple of weeks. 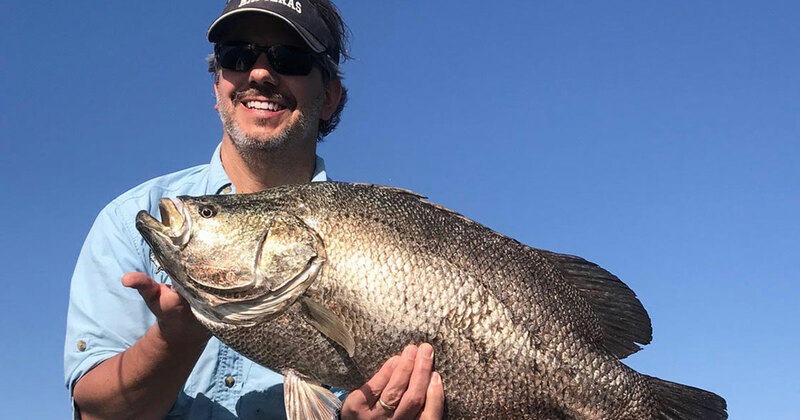 The black drum and trout bite has been consistent in the Indian River as well. 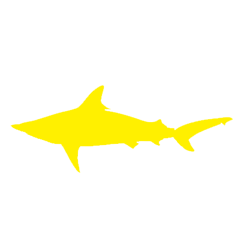 If any of this interests you be sure to check out our website to book a charter. 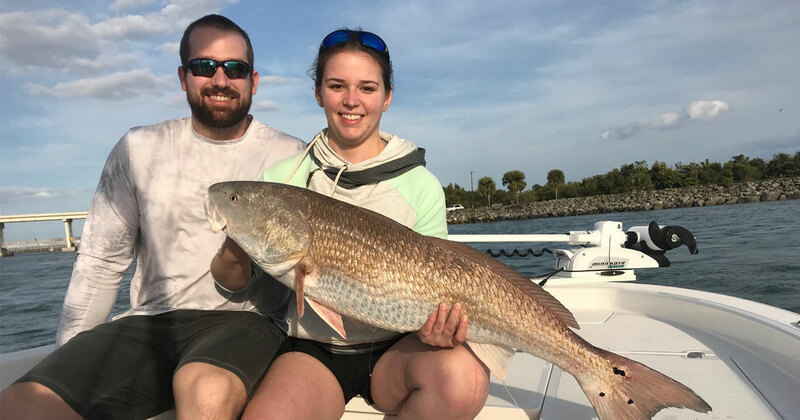 Blake and Natasha with a nice red. 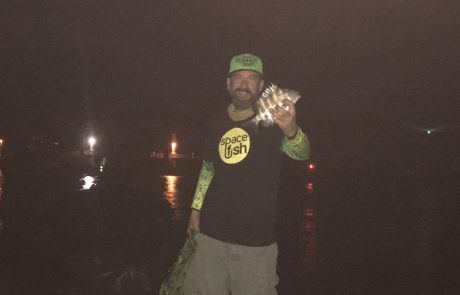 Early this week we had a good redfish night in Sebastian Inlet but the bite died off with the full moon. 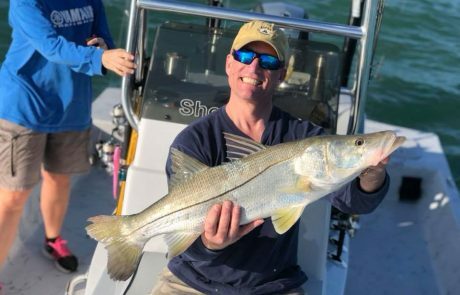 The snook bite during the day by boat is still very slow even as the waters have been warming up a bit. 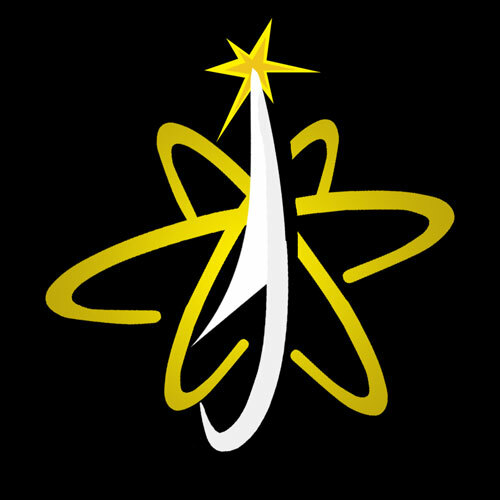 The bite should improve this week as the moon slowly disappears. 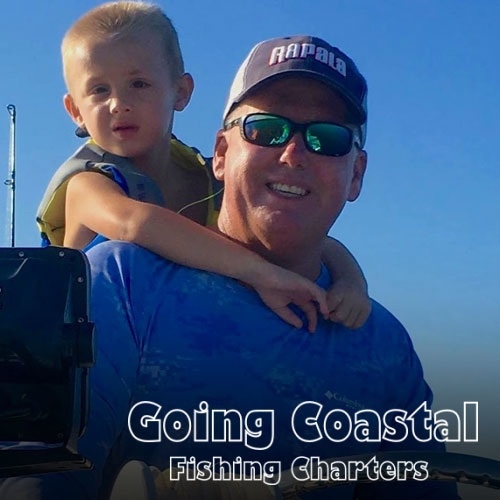 The beach bite has been great with a lot of Spanish Mackerel, jacks and Bluefish with a few small barracuda and sharks mixed in. 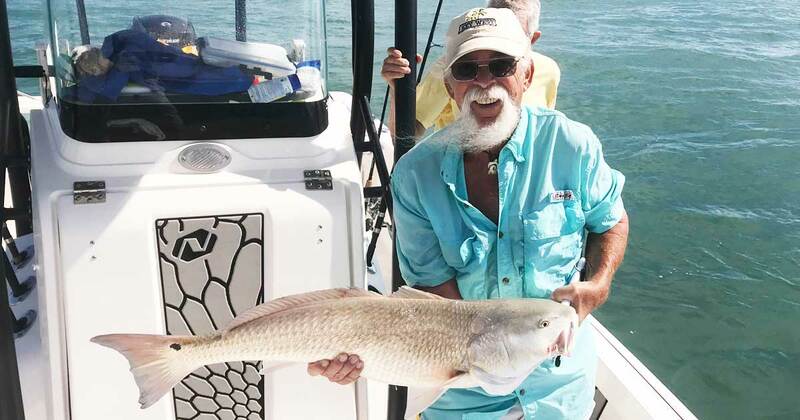 The whiting and weakfish are plentiful from the boat too using live or dead shrimp and fish bites. Cobia are on rays a few miles offshore and if that water stays in that 68 degree or a few degrees warmer, it should remain plentiful on rays and the nearshore/offshore reefs. 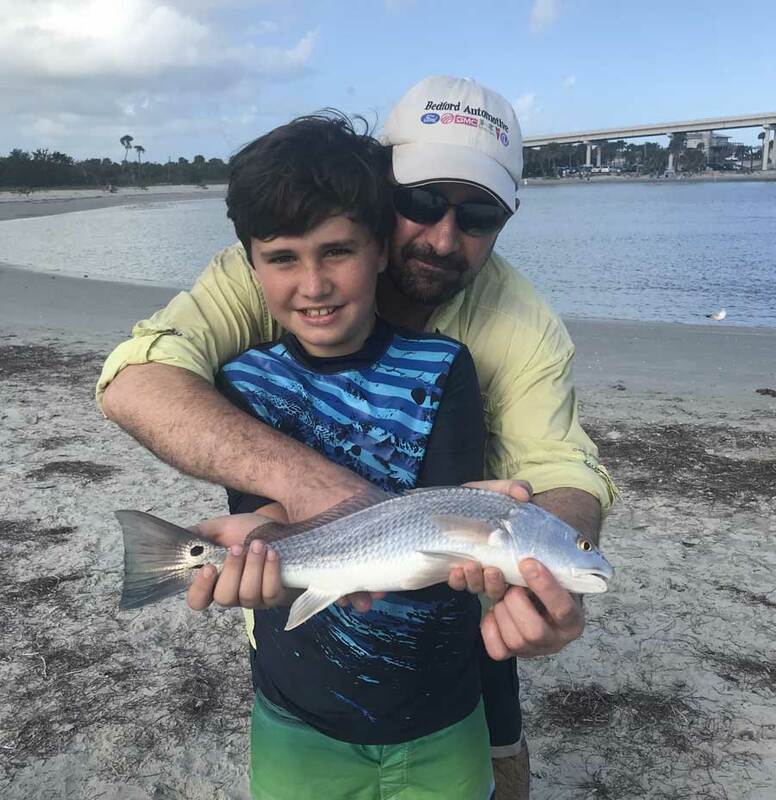 Inshore, the pompano have been thick around the islands and the trout, redfish and small snook are scattered around the mangrove shorelines. Tripletail are along the channel markers and the Storm Coastal Shrimp have been working well for us. Next week will be a bit windy but the fishing should get better with the moon going away and the water warming up a bit. 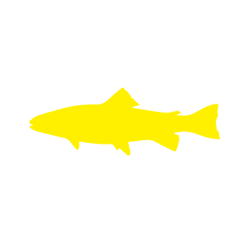 Look for more snook and redfish in the inlet and inshore, as well as cobia and possibly some tarpon nearshore. 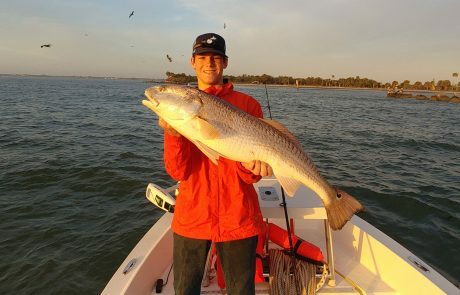 Joe got a beauty of a redfish! Our week started off slow with windy weather and cold water temps. 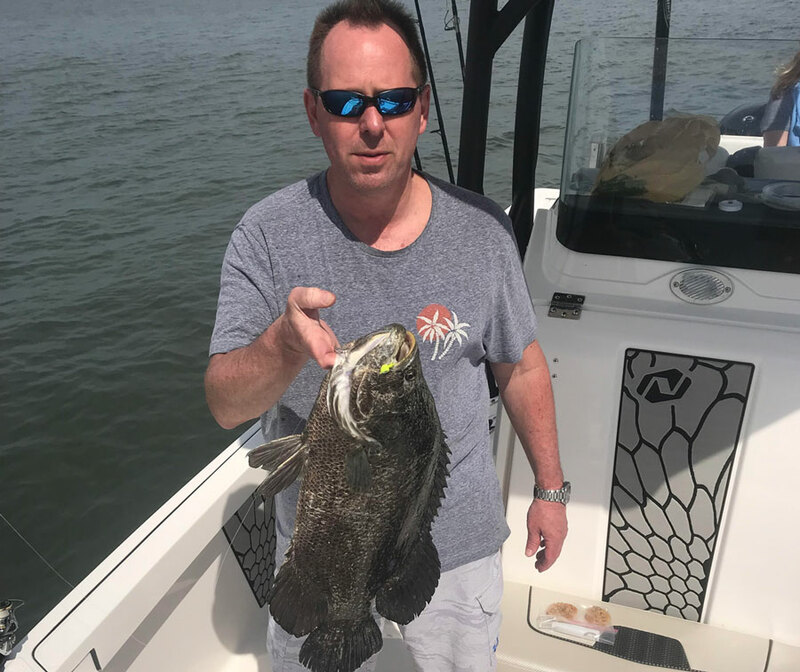 The Mackerel and Bluefish were hitting and a few trout and triple tail were inside but the inlet bite was slow during the day. Late in the week the reds showed up and were feeding but the snook still haven’t been active. 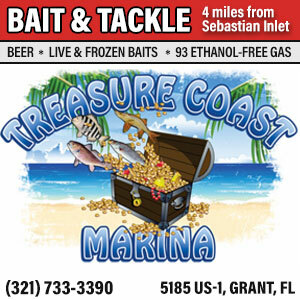 Look for the warming trend we are having to help improve the bait situation inside the Indian River and the beaches and the bite should get better everywhere. 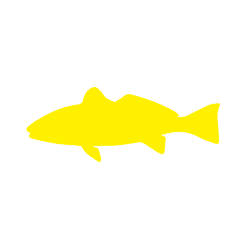 Live pinfish and Mojarra should be great baits for the snook as the water warms up and the redfish will eat the same. The rays should be moving through with the warmer waters as well and should bring some cobia with them! 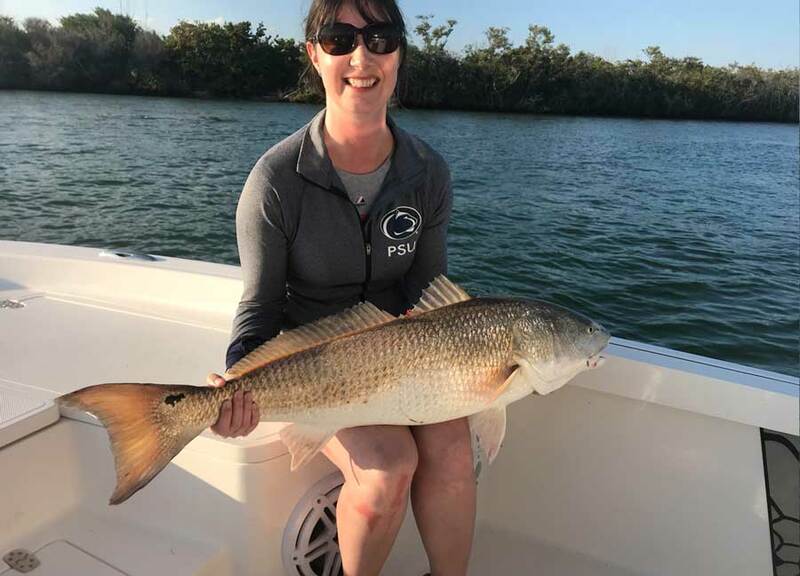 Debbie with a nice red, too! 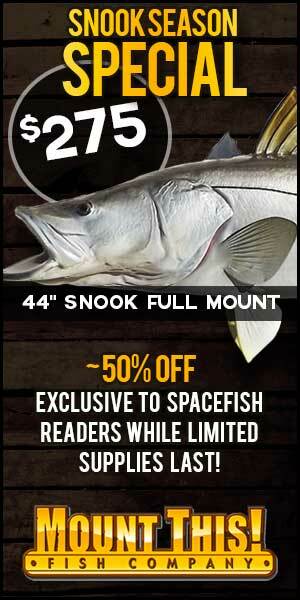 Snook remain a hot ticket on the beach -- get out there and take advantage while you can! 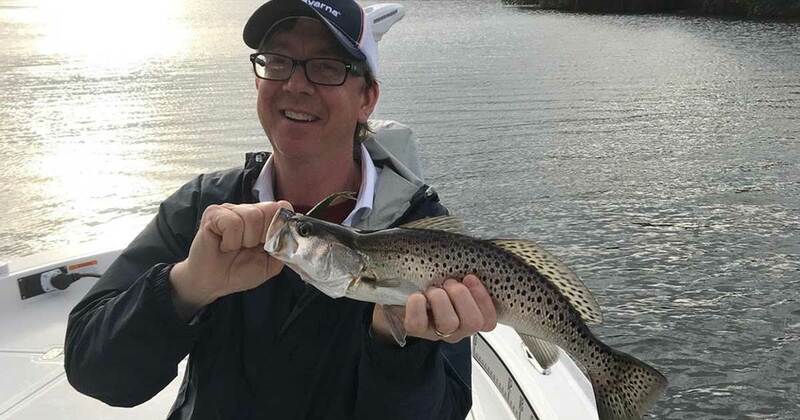 The seatrout bite is great in the lagoon right now! 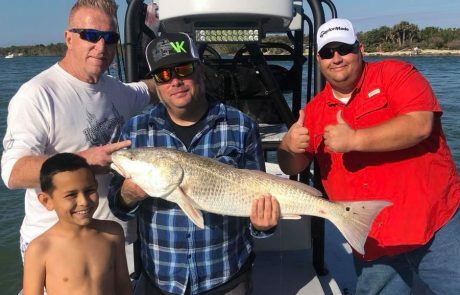 Monster jacks are running off the beach from Port Canaveral to Sebastian Inlet. 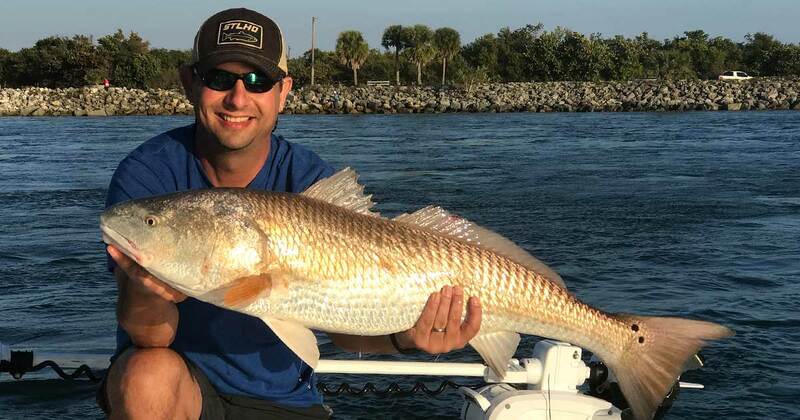 Along with snook and seatrout, the redfish bite has been active from north to south throughout the Space Coast. The blacktips are still here. Take advantage of the big numbers of fish while the migration lasts.